Progressive Democrats of America (PDA) is dedicated to stopping global warming and protecting our environment. 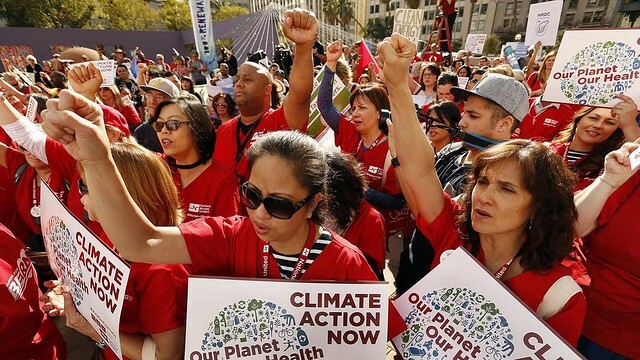 We're supporting Oscar-nominated filmmaker Josh Fox and our allies from the California Nurses Association (CNA) who are working to inspire, educate and mobilize the movement towards greater climate action and push hard against further expansion of fossil fuel infrastructure. Will you join PDA and the Nurses at UCLA for a showing of Josh's Film How to Let Go of the World And Love the Things Climate Can't Change? RSVP at their Facebook Event. Not on Facebook? Just show up. CNA, PDA, and other allies are hosting the screening on the UCLA campus along with student, environmental and social justice groups from around Los Angeles. Admission is Free! Wednesday, October 12, Reception at 7:00 p.m. Film at 8:00 p.m. at the Bridges Theater, Melniz Hall at UCLA. (Yes, we know it's Yom Kippur, and we apologize to our Jewish friends who cannot make it. Note: there will be other showings in the L.A. area.) Please support our efforts with a generous donation now. Money short? Then contact Mike "Phone Guy" Fox to sign up to make important movement mobilizing phone calls or contact PDA Field Coordinator Judy Hess to get help organizing in your area. Join The California Nurses Association and PDA fighting for climate justice and standing in solidarity with the Standing Rock Sioux Tribe in North Dakota, October 12th at UCLA: RSVP at the Facebook Event or if you're not on Facebook, just show up for a screening of the film: How to Let Go of the World And Love the Things Climate Can't Change. We must act to confront the climate emergency now. Delay is not an option. Denial is not an option. Despair is not an option. Please join PDA acting decisively now! Support our efforts with a generous donation now. Money short? Then contact Mike "Phone Guy" Fox to sign up to make important movement mobilizing phone calls or contact PDA Field Coordinator Judy Hess to get help organizing in your area. Join PDA opposing the incredibly destructive process of cracking apart the bedrock of the planet to extract carbon fuel know as Hydraulic Fracturing or Fracking. Oklahoma is ground zero for this reckless technique, and the impact is increasingly perilous. Oklahomans now actually have apps on their phones to warn them of impending man-made earthquakes! We can't let this become the new normal. Get involved now, before it's too late. P.S. We're here to help you make progress in your state and locality! If you need any help organizing a new PDA chapter or energizing your existing chapter, please contact PDA Field Coordinator Judy Hess. Follow PDA and share our articles on social media.